Anyone of a certain age will remember Nakamichi as the absolute pinnacle of Cassette deck builders. They've struggled a bit since those days but are now back with a bang and a range of really innovative audio hardware. 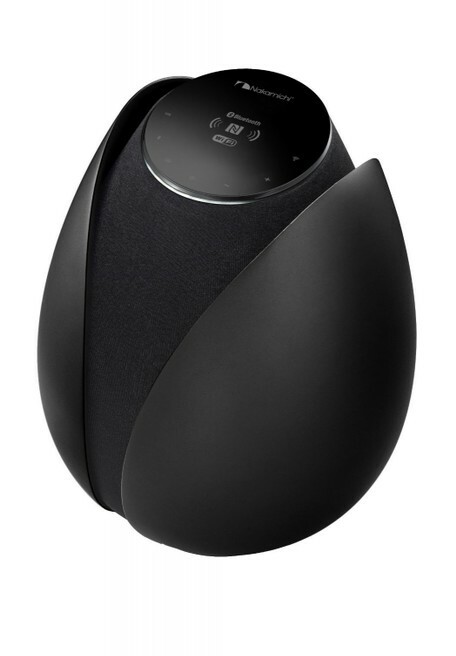 The Dragon Lily 2.1 speaker system is the first of those to reach us for review. The Dragon Lily is a fabulous single box 2.1 speaker system that looks stylish in black, red or silver and sounds stunning. It is highly adaptable with a wealth of inputs including every wireless standard we can think of being covered by its Air Cast system. Highly recommended. Sounds great - the combination of some clever electronics and a thumping down facing woofer can fill a room with beautiful sound. Looks great - someone who saw it said it would look good as an interior decorators dressing piece. No Apt X - On a device of this quality we would have liked to have seen this advanced audio form of bluetooth implemented. The remote control is not paired with the device so if you have more than one Dragon Liliy one remote will control all of them at once. 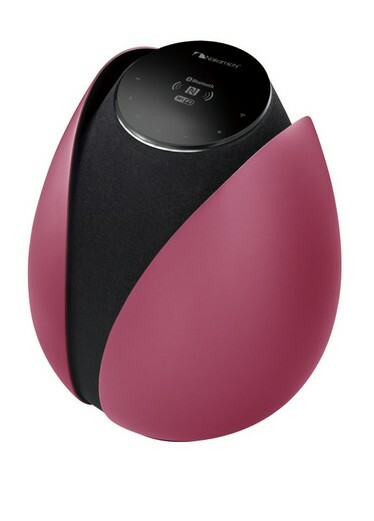 If there was an award for most adaptable speaker in a single box the Nakamichi Dragon Lilys would win it hands down. Other than any form of digital line in it has just about every input going. 3.5mm aux in - note this is analogue only and there is no optical in which some might see as a shame. USB in (and charge out). This can be used to paly from a USB stick but only MP3/WMA files are supported and there is no indication in the documentation of what file structures are supported - it wouldn't play from my Lumia 920 for example. It also can not be used as a USB audio device for a PC. However it does support the iPhone and iPad really well - playing any audio on these devices immediately plays on the speaker. One thing to note the packaging gives the impression you need to buy a special cable to do this but in fact your normal iPhone cable will work. Air Cast is really impressive and works in two modes. When you first get the speaker it is in access point mode which basically means it sets up its own wireless network that you can connect your phone or device to and then either use DLNA or AirPlay to play to it. However if you would rather your speakers were on your own network you can use a configuration web page to set up what wifi network to connect to and then change a small switch on the back of the unit to Client mode. The Speaker will then, if you have the right settings, connect to your network and be visible there. Excellent stuff and pretty easy to follow with very good guidance in the supplied manual. Bluetooth - A2DP and AVRCP - this latter means you can remotely control your device from the speaker. Note the lack of AptX. AptX is an emerging system for playing audio over Bluetooth at higher bandwidth than is supported by A2DP and whilst its absence is made up for by the great Air Cast system it certainly would have complemented the quality of this system. NFC - if you have an NFC enabled device then this makes pairing to the Dragon Lily over Bluetooth a doddle. I just tapped my Nokia Lumia 920 on top of the speaker (gently of course) and I was immediately prompted to pair, one tap on the Lumia screen and it was done. Subsequently tapping on the seaker started playback immediately. It was slightly more confusing when using Sony Android phone as there was no prompt displayed but pairing had just happened. Control for all this fabulous connectivity is either by a stylish (I think glass) touch panel on top of the speaker or a very solid feeling but small lozenge shaped remote. As you touch the controls on the touch panel very subtle and stylish white lit symbols give you feedback. The panel has controls to choose between sources, adjust the volume and the remote has all these but adds playback controls for Bluetooth and USB sources. Which brings us on to how the Dragon Lilly sounds. The simple answer is for a single box unit pretty fabulous. There is a real clarity and transparency in the presentation. Frequency response seems really good with no noticeable transition form the pounding but very tight downward facing sub woofer to the main speakers. Compared to speaker and amplifier combinations three or four times their cost there might be some cloudiness in the midrange but it is very minimal and you are going to need to jump up to that kind of level to get something even a little better. They are really exceptional for the money. The only area of any dissapointment is soundstage which seems very narrow. They can fill a room and this lack of soundstage is cearly a limitation of the single box design but others (notably the B and W Zeppelin) do achieve better results. To be honest though the sheer likeability of the sound of the speaker system makes this soundstage issue a minor point. I should again mention my bias toward accurate reproduction and clarity over colour. If you prefer analogue to digital you might want to audition these speakers before parting with your cash. In fact we would always urge auditioning any audio equipment before parting with your cash. The bottom line though is the Nakamichi Dragon Lily speakers need to be listened to.